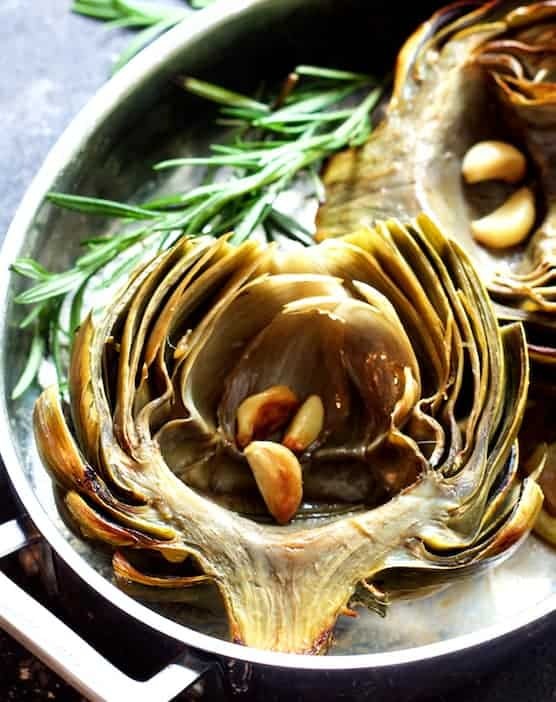 Oven Roasted Artichokes with Roasted Garlic Butter is an easy way to cook artichokes to preserve their wonderful, delicate flavor so it isn’t boiled or steamed away! Trimming and prepping artichokes used to mystify me–I was so afraid of them! Until a few years ago, the only way I prepared them was to cut the bottom off so they sat level in a microwave-safe dish and then microwaved them in water for approximately 15 minutes. It was faster than steaming or boiling. I know…..pretty unimaginative for someone who cooks for a living! Then, a client of mine requested I prepare them for her. Gulp. Oh, sure…. I could have just boiled or steamed them. However, that wasn’t very “cheffy” and the presentation would have been lackluster at best. I didn’t know how they’d reheat prepared that way or if they’d even have any of their delicate flavor left. My client would also have had to deal with the inedible “choke” in the center. 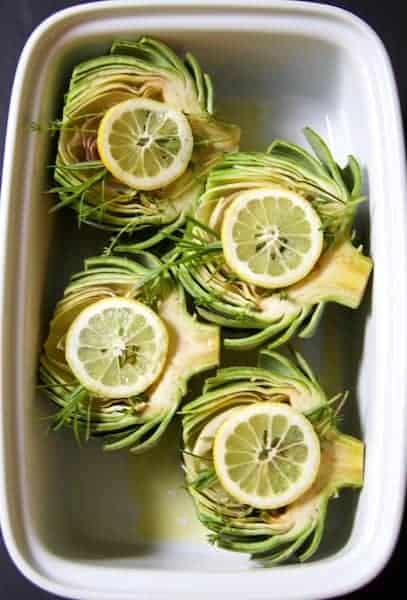 To make her artichoke “experience” as easy as possible, I made these beautifully trimmed and amazingly aromatic Oven Roasted Artichokes with Roasted Garlic Butter that I roasted with lemon slices, garlic and herb sprigs. 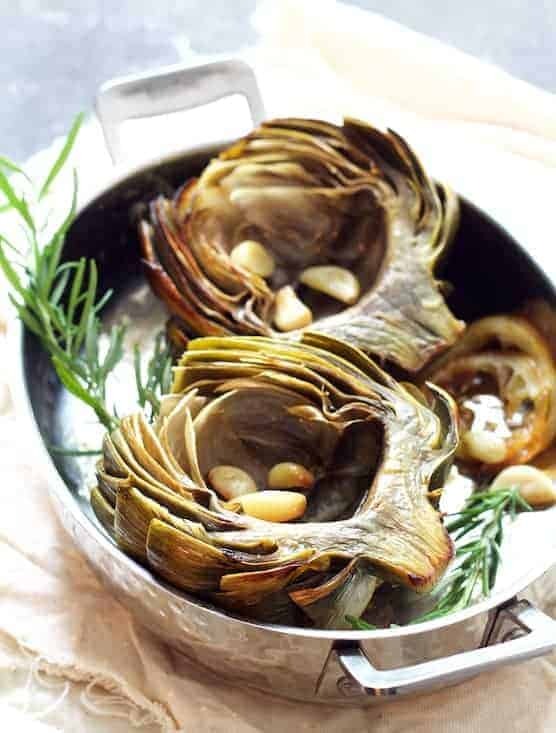 What I love about roasting or baking artichokes is the delicate flavor concentrates and stays IN the artichoke–it’s not boiled or steamed away. The other wonderful thing about preparing artichokes this way is that your guests don’t have to deal with the fuzzy choke either. Have acidulated water ready to prevent browning. For each quart of water, use about three tablespoons lemon juice (about 1 large, super juicy lemon) or 1/2 cup dry white wine. After each trimming step, place the cut side into the acidulated water. Another option is to simply rub the cut side with lemon. My experience has been that artichokes turn slightly brown no matter what–much like an avocado. However, because the artichokes get nicely browned from the roasting process, you won’t notice the discoloration much. For more information on prepping artichokes, here’s an instructional video from Ocean Mist. When the artichokes are tender, take the garlic out and make a roasted garlic butter to serve with the artichokes. Perfection! Here are more amazing artichoke recipes that your guests will love! Don’t boil or steam the delicate flavor of artichokes away! Oven Roasted Artichokes with Roasted Garlic Butter is an easy way to cook artichokes to preserve their wonderful flavor. As you complete steps 3 through 8, immediately immerse the artichoke in the lemon (acidulated) water. Trim any dry stem end from the bottom of the artichoke. Remove tough outer leaves from the bottom of the artichoke. Trim approximately 1 inch from the top of each artichoke. Cut the artichoke in half from top to bottom. Scoop the fuzzy choke from the center of each artichoke. Drizzle a large baking dish or roasting pan with olive oil. Season artichokes with salt and black pepper. Place 3 cloves of garlic in each artichoke, top each with a sprig of thyme and rosemary, then place a lemon slice on each. Carefully flip the artichoke half over so that the cut side is facing down. (Make sure the garlic is securely inside so that it doesn't burn.) Drizzle with olive oil. Place the softened butter in a small saucepan. Remove the garlic cloves from the pan and add to the butter. Mash it into the butter, then gently melt the butter. Serve the artichokes with the butter. 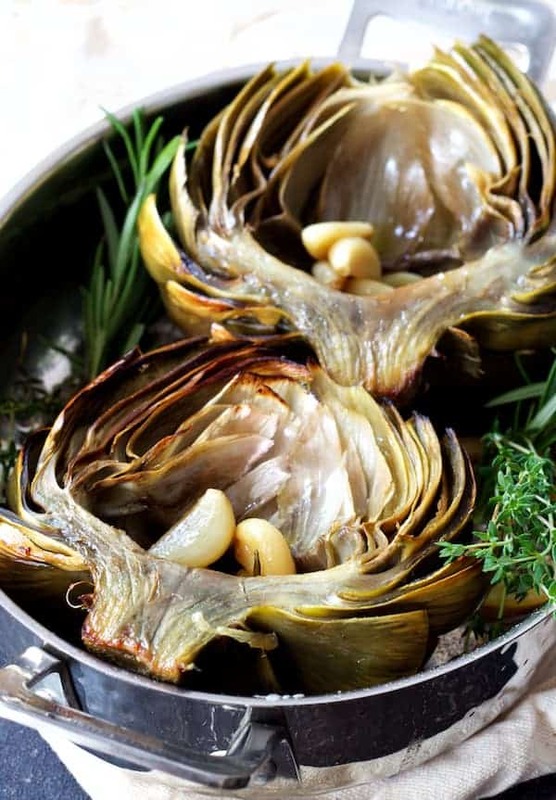 TO MAKE AHEAD: Roast until the artichokes are almost tender (about 40 minutes). Cool and refrigerate. Mash the garlic into the softened butter and refrigerate. Heat covered in a 375 degree oven until tender. Melt butter and serve. The nutritional information below is only an estimate. Please do your own research with the products you're using if you have a serious health issue or are following a specific diet. Hi, Joseph, Not sure what wonkiness is going on but I am seeing a recipe. Please respond back if you’re still not seeing one. Thanks so much! Such a simple and perfect recipe! The artichokes had such a great refreshing flavor, perfect summer treat! Thanks for sharing! Thanks so much, Sam! Doing artichokes this way really does make the flavor come through! So glad you enjoyed! I decided to try growing artichokes when our kids were small. From then on, artichokes have remained a favourite treat for all of them! Hi, Tina, We grew them once here in the South. They were small but delicious! Thanks so much! Amazing! I wish I could upload a picture…they turned out so lovely! 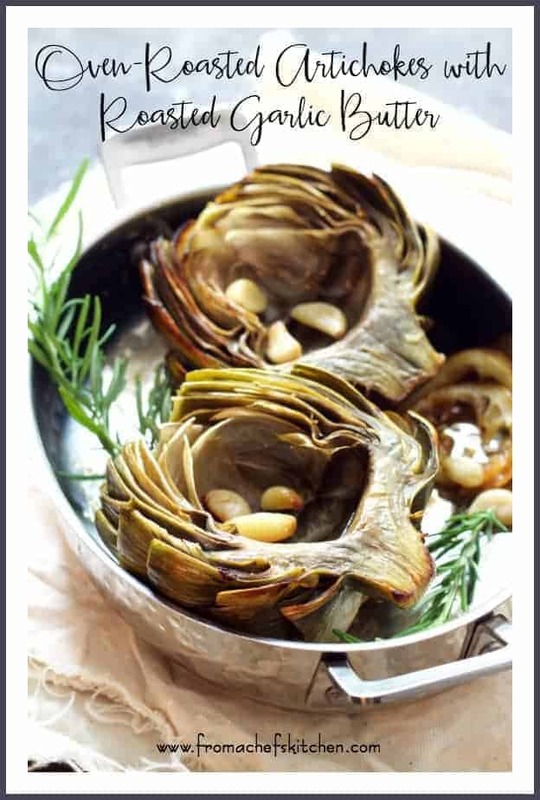 Thank you so much for this recipe, I will never boil an artichoke again! Hi, Daniella, Thanks so much! It sure does make a difference, doesn’t it? So happy they turned out beautifully for you and that you enjoyed! Thanks again! This looks so wonderful..I cannot find a recipe though..going to just wing it, but not sure how long to cook them for. Hi, Sarah, I don’t know what kind of crazy internet glitch happened to make my recipe disappear, but it’s back! Wow. Please give it a try and hope you enjoy! I just made this tonight and oh my god! I think this is my new go-to recipe from now on. Beautiful and delicious! And I love how they look like birds’ nests with garlic “eggs” – so perfect for spring! Hi, Kelly! I love it! Thanks so much and so happy you enjoyed. Roasting artichokes does make a huge difference! I am an artichoke fiend. This is far and away the best i have ever had. Thank you so much, Jennifer! I’m an artichoke fiend too and yeah… this beats steaming or any other method. Hi, Jenny! Thanks so much and so glad you enjoyed! Please stay in touch! This is now my go to for making artichokes. The steps were so easy to follow. The flavor was fabulous! I didn’t even make the garlic butter. Thanks, Molly! It’s amazing how roasting preserves that delicate artichoke flavor and even intensifies it. Thanks so much and so glad you enjoyed! Please stay in touch! Sometimes I am scared to try the recipes I find on pinterest, but this one is amazing. The dipping sauce is barely needed because the artichokes are so flavorful. Great Recipe! Hi, Lindsey, Thanks so much and you made my day! Glad you enjoyed and please stay in touch! I’ve always wanted to cook with artichokes, but a bit intimidated with how to even approach them! Thanks for the great tips and recipe in this post. Now, to go out and pick up some artichokes! I always steam my artichokes. What a fun and tasty looking alternative.. I love how simple and delicious roasted veggies can be! You sure took these over the top with the roasted garlic butter! So much YES!!! That infused butter sounds over-the-top delicious. I ADORE artichokes, but have never roasted them before! I love this idea and they look absolutely brilliant! Must try next time I get artichokes! Thanks! I love artichokes, but I’ve never made them at home. I’m a little intimidated by them, but this guide is perfect! I need to try making them! Those artichokes look like to die for. I’ve actually never tasted one because we don’t find them in India too easily. But if I do, this is the recipe I’m going for. And that picture is perfect! We love artichokes in our house – even the kiddos. We even grow artichokes in our garden. Now I have a new recipe to try out with our next crop of artichokes! Thanks, Laura! We actually tried to grow them once here in the South. They didn’t get very big, but they still tasted great! Would love a “crop” of artichokes! I adore artichokes! Your photos are stunning! Mmm, that roasted garlic butter sounds perfect with the artichokes. I haven’t had roasted artichokes, but I love how sweet garlic goes, this is definitely something I need to try although I’m kind of scared of artichokes too, I’ve only ever bought them in a jar! !